The Open dialog box shows up, which is a far better tool than the Open screen for hunting down files. In the Open dialog box, choose All Files (*. *) as the file type. The File Type menu restricts the files listed in the Open dialog box to only those types specified. The All Files (*. *) type lists all files, which includes formats Word may not recognize. For example, the old WordPerfect (for DOS) file type. Choose the file to open. The file opens in Word, translated from whatever file format Word recognizes into a document. If the file type isn’t recognized, Word displays the File Conversion dialog box, similar to what’s shown here. Work the controls in that dialog box to see whether you can massage the text into a digestible format. If so, click the OK button. If not, click Cancel and accept that the file can’t be opened. 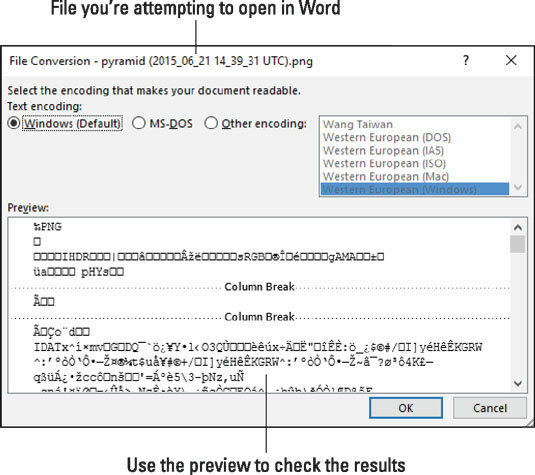 Word attempts to translate an unknown file. The controls in the File Conversion dialog box are rather limited. If you don’t see what you want immediately in the Preview window, give up. In the figure, a graphics file is attepted. The proper way to insert graphics into a document is to use the Insert Pictures command. You can reset the Ctrl+O command to bring up the traditional Open dialog box. Or just remember that somehow the Ctrl+F12 keyboard shortcut automatically summons the Open dialog box. Word once had a feature called Recover Text from Any File. It appeared on the File Type menu in the Open dialog box. When that option was chosen, Word attempted to open the file and, if it had trouble, display the File Conversion dialog box. This feature is now built into the All Files (*. *) file type.